Inside: Are you longing for a slow, simple Christmas with your kids? Get 6 tips to simplify your Christmas traditions, so you can actually enjoy the Christmas season (instead of collapse at the end)! I remember vividly the day I sat in a circle with a big group of moms discussing the importance of creating traditions for your kids, starting when they are little. As the holiday with the most traditions, Christmas was the central topic of discussion, a discussion that led far, far away from the slow, simple Christmas I craved. I remember it so well because of the crushing pressure I felt. When your kids are small and you are barely treading water as a mom, the last thing you need is additional expectations and pressure, especially during Christmas. And it’s not just you that needs slow and simple: your kids need simple, too. These moms were tossing around ideas for 25 Days of Christmas Activities. There was a different activity that you HAD to do every single day! Maybe some moms are over the moon for this stuff, but me? Even with only one kid and one on the way at the time, just the thought of it set my pulse racing and my chest tightening with anxiety. Somehow, our current parenting culture has convinced us that our kids need more: more of us; more activities; more traditions. More. More. More! The busier, the better. But first, think about how you respond to more, particularly in your schedule. Your stress level increases. Your temper is shorter. You rarely slow down to enjoy what you’re doing right now because you’re too busy thinking about the next thing you need to do. You’re constantly running down your to-do list in your head, making sure you haven’t forgotten anything. Your kids feel the same way, just without an adult grid for how to cope with it. While I do believe that family traditions are valuable, I now know from experience that you don’t need a million traditions to love Christmas. Kids don’t need a whole lot to have a meaningful Christmas. After enduring two Decembers hugely pregnant (really, really bad timing), I appreciate simple Christmas traditions more than ever before. Those Decembers, I had so little energy that I was forced to choose our activities wisely: simple Christmas was the only option. And guess what? I haven’t heard one complaint about those slow, simple Christmas seasons. My kids still loved Christmas just as much. Here’s the thing: everyone has an opinion on the best way to do this whole parenting gig, including Christmas and every other major holiday and minor detail. Unfortunately, the loudest, most opinionated voices always find the ears of the mom who is most desperate to know how to do it the “right way” – the one who takes those “should’s” deeply to heart. The people sharing all those opinions? They aren’t living your life. They don’t know you, your home, your kids, or your circumstances. They won’t be the ones running around like a crazy woman this Christmas trying to do ALL. THE. THINGS. It’s your Christmas. You should decide how to celebrate it – not them. Of all the times of year to choose simplicity, this is the best, most special time of year to do it. And as a mom of four who has done it both ways, I strongly encourage you to choose the simple Christmas. Minimalism has taught me that less is more, pretty much always. 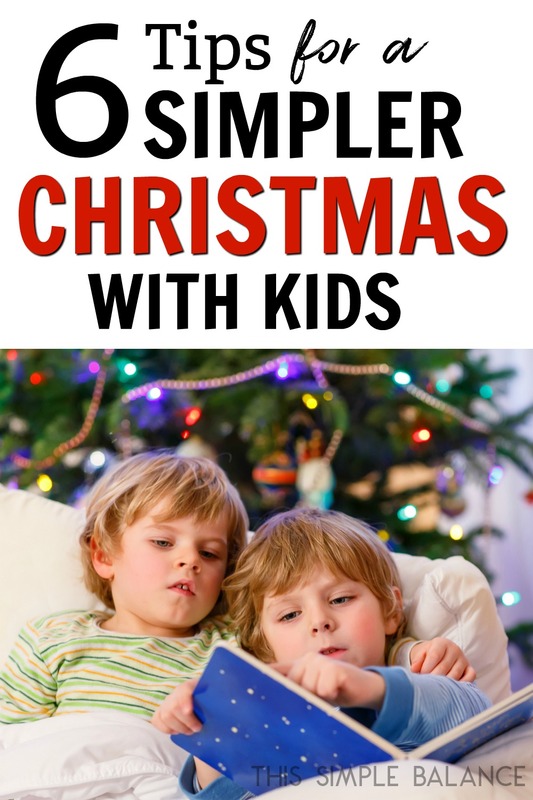 Your kids will love Christmas as much as the kids running around to do every Christmas activity known to man, and you will truly be able to enjoy the Christmas season (and not collapse with exhaustion in January saying, “Thank God, it’s over!”). 2) Listen carefully to what your kids look forward to. Kids may say that they want to do everything, but if you listen carefully, you can usually hear which events are their favorites. Talk with them in November about what they are excited about for Christmas. Do they align with your favorites? Perfect! Simple Christmas just got easier. If they list several things, try to get them to prioritize. Choose their top two or three traditions they would really miss if you didn’t do them. At the end of the day, you need to be the bottom-line decision maker. If it all adds up to be too much, cut the events that take the highest amount of effort that were least loved. If you feel tons of pressure trying to decide what to cut, remember: there’s always next year. If you have to cut something out, remind your kids (and yourself) that you can always reevaluate next year. It’s not the end of the world. When you start having kids, the pressure to say yes to everything increases. Holiday parties, cookie exchanges, gift exchanges, Christmas ornament making, the list goes on. Remember that you need to decide what is best for you and your family. Does it bring you joy? Is it a “Heck, yes!”? If it’s not, it probably shouldn’t be on your list of activities, unless it is a family event that you cannot possibly miss. Even then, there’s wiggle room. For example, once our family grew to six (with four kids six and under at one point), we knew that having a restful, enjoyable, simple Christmas meant saying “no” to travelling to see family every year. Do I feel a twinge of guilt sometimes? Yes. But it’s the best choice for our family. While I do my best not to overschedule December, I do have an extroverted child who loves activities and can handle a bit more in her schedule than I can. If you have kids begging to do more than you want to do, try to compromised by outsourcing those extra activities. Have a friend offering to host a gingerbread making party at her house? Ask if a child can tag along with supplies. Does your mom love baking and decorating Christmas cookies with the kids? Let her take that one: you don’t need to do every single Christmas activity on your list with your kids. 5) See the little things as traditions, too. Sometimes, we only think of the big events that require tons of effort as traditions. But what if the little things were, too? Sitting together on the couch at night to enjoy the Christmas lights. Christmas music playing in the house every day. Making sure Christmas candles are lit daily so the house smells like Christmas. Reading Christmas books for kids during your usual read-aloud times. Slowing down for Christmas lights on the way home from the grocery store. Having candy canes to put in your hot chocolate all season long. It’s the little things, the simple things that all come together to make Christmas the amazing season that it is – not just the brief, tons of effort events. 6) Don’t be afraid to “try on” a new tradition. Just because you do something one Christmas does not mean you are committing to it every Christmas. Don’t be afraid to try new things! I received a Jesse Tree Advent Book & Ornament Set for free in exchange for a review, but as always, all thoughts and opinions are my own. You can see my disclosure policy for more information. This Christmas, we are trying a simple Jesse Tree Advent book with handmade ornaments. It’s something I’ve meant to do in years past, but never found one I liked. When my friend Katie offered to give me a set of her handmade ornaments with accompanying Advent book she wrote herself, I jumped at the chance to try it! Before you scratch your head at my eagerness to try something that involves doing something every single day until Christmas, this activity will actually help us slow down. This kind of Advent looks like snuggling up with your kids on the couch at home to read a quick, 5-minute story and have a brief conversation (questions accompany each reading) if they are up for it. They get to hang another ornament on the tree, put a sticker on their chart, and the day goes on. Perfect for a slow, simple Christmas. Step back for a minute and think about the things that made Christmas special for you. What do you remember? What made it special? What do your kids talk about months in advance (if they are old enough to do so)? If even those things seem like too much, simplify them even more. Gingerbread houses don’t need to be homemade (they really, really don’t). Buy a simple kit, and let them at it! 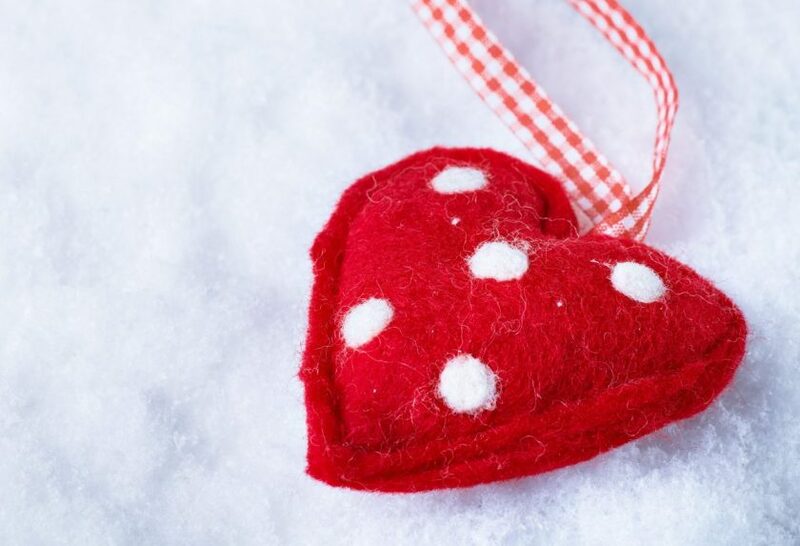 You don’t need to buy and put together everything your kids need to make their own ornaments. There are people who love doing that kind of thing: buy a kit to make your life easier and your Christmas less stressful. Let go of the guilt and simplify your Christmas. Your kids will love it just as much. Promise. This year, we’re planning on having a quiet Christmas just as your blog suggests. We’re even reducing the number of presents and, instead, donating some money to a women’s shelter. The kids have enough toys. Thanks! We’ve learned simple Christmas since moving overseas and though we miss family and all the things that come with American Christmas (lights, smells, foods), I’ve grown to love our little Christmas here and enjoy the big one more when we get to be a part of it in America every few years. 🙂 I’ve been wanting to use Katie’s advent for years now but never brought it here… but this year we’ll be back from December so I’d love to try it! The ornaments from the Advent set are absolutely adorable and my kids would have so much fun with them. 🙂 And we are ALL over the simple-is-better notion when it comes to holidays especially. My kids always remember and talk about the simple things, no matter what: visiting Bass Pro (nearby) and just walking around and seeing the decorations; driving through town to see the lights; choosing which stocking they want to use this year and hanging it up (we tend to swap back and forth). You can have big memories on a small budget and with simple, meaningful traditions! Thanks for these tips!